This allows positions to be worked out quickly and easily from an ephemeris. It was originally intended for when orbital elements were not readily obtainable (e.g. objects still on the NEOCP) so that accurate telescope pointing and rate of motion could be achieved. However, it is now used for all ephemeris work at the telescope (and also when reducing measures with Astrometrica) to interpolate between the standard ephemeris intervals. Three or more ephemeris lines are pasted into the large text box in the centre of the form, together with the object name at top left. The ephemeris can then be added as a 'tab' at the top of the form. There is no practical limit to the number of objects and ephemerides that can be added in this way. The required date, hour, minute (and optionally second) is then entered. Pressing the Calculate button works out the RA, Dec, Speed and PA of motion using a second order interpolation method having added the three lines used for the interpolation into the boxes in the upper half of the form. A separate configuration file allows virtually any ephemeris format to be used very easily. A separate 'pad' can be undocked from the main form (visible to the upper right in the screen shot above) which is set to be an 'always on top' window for ease of use when getting results into other software. 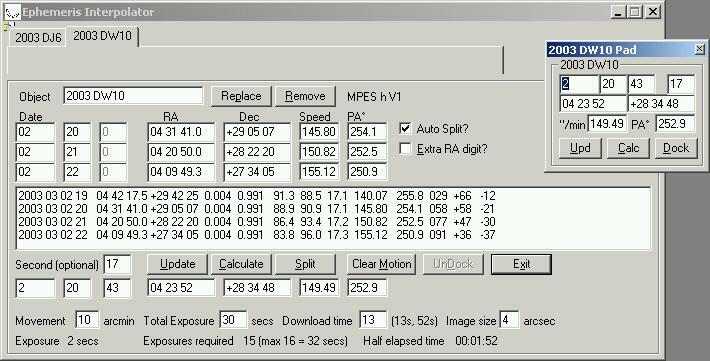 An exposure calculator at the bottom of the form allows the optimal length of exposure to be determined and the total number of exposures required. It also displays how long half of the images will take to expose. This allows the telescope to be positioned so that the (fast moving) object passes centrally through the field of view in the middle of the sequence of exposures.